국제아로마테라피협회 개발하고 올댓허브에서 제공하는 비누계산기(가성소다계산기)를 사용방법과 함께 공개합니다. 구글 플레이 스토어에서 '국제아로마테라피협회'를 검색하시고 '비누계산기'를 찾아 설치하시면 됩니다. 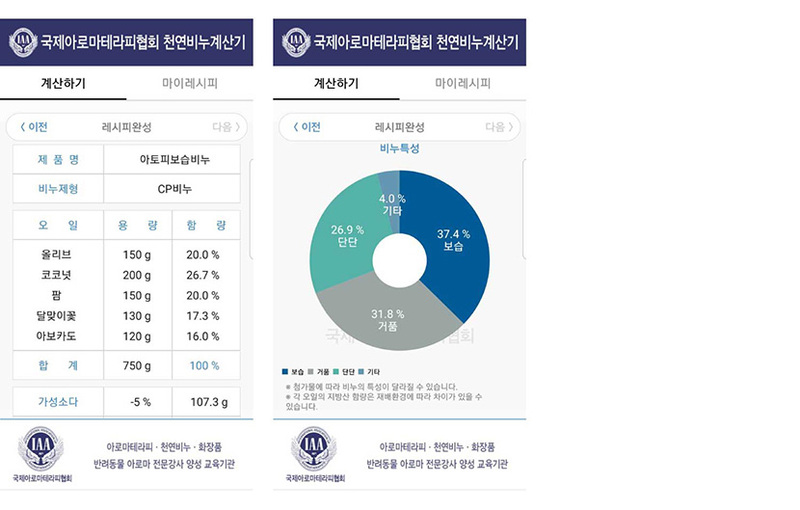 국제아로마테라피협회 비누계산기는 CP, HP액체, HP투명, HP크림, 연비누 총 5가지 기법 계산기로 올댓허브에서 제공하는 가장 정확하고 유용한 천연비누계산기입니다. CP 비누, HP 액체비누, HP 투명비누, HP 크림비누 (폼클렌저), 연비누 등 5가지 기법이 하나에 총 망라된 비누계산기앱 입니다. 그리고 비누레시피 구성시 식물성 오일값만 입력하시면 가성소다, 가성가리의 양이 자동으로 계산되며, 또한 가성소다 및 가성가리 양을 조절하는 기능이 있어 편리합니다. 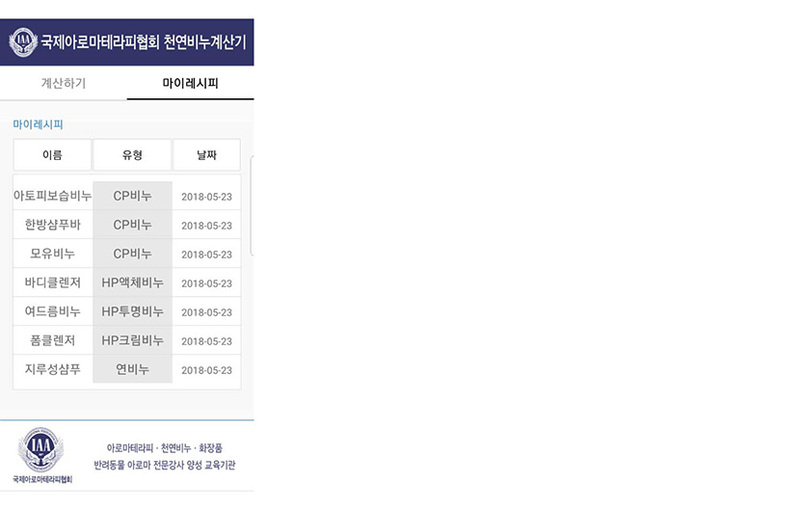 비누의 특성 (보습, 거품, 단단)을 그래프로 나타내어 레시피만으로도 비누의 사용감을 미리 알 수 있습니다. ※ 식물성 오일의 지방산 %에 따라 비누의 특성 (보습, 거품, 단단)을 알 수 있기 때문에 비누 제작시 식물성 오일의 사용비율이 75% 정도인 CP 비누는 비누의 특성을 미리 알 수 있지만, 식물성 오일의 사용 비율이 50% 이하인 비누는 식물성 오일만으로는 비누의 특성을 미리 알 수 없기 때문에 그래프로 나타내지 않았습니다. 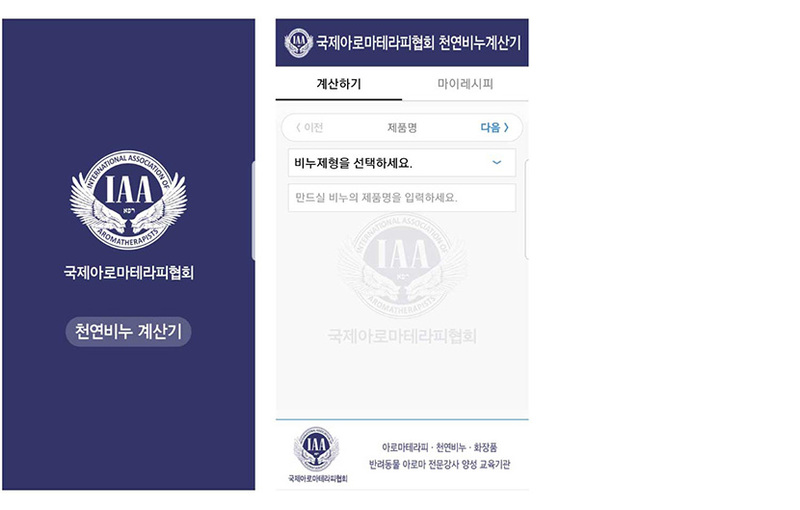 '마이레시피'에 1,000개 이상 레시피를 저장할 수 있습니다. Soap Calculator developed by Allthatherb is helpful for those who love an organic soap?to be more aware of its ingredients and techniques in detail. With the Soap Calculator, it is possible to calculate CP soap, HP liquid soap, HP transparent soap, HP cream soap, Soft soap and so on. Also, there are contacts of institutes affiliated to International Association of Aromatherapists so that anyone who would like to make soap can easily learn from nearby. 1. Include 5 techniques of making different types of soap in one app. (CP, HP liquid, HP transparent, HP cream/Foam Cleanser, and Soft soap) And Easy to calculate necessary amount of Sodium Hydroxide and Potassium Hydroxide by just putting the amount of vegetable oil in the calculator. Soap with less than 50% vegetable oil in soap making is not shown graphically because the characteristics of the soap are not known in advance. 3. Available to save in ‘My Recipe’ and print out more than 1000 recipes. 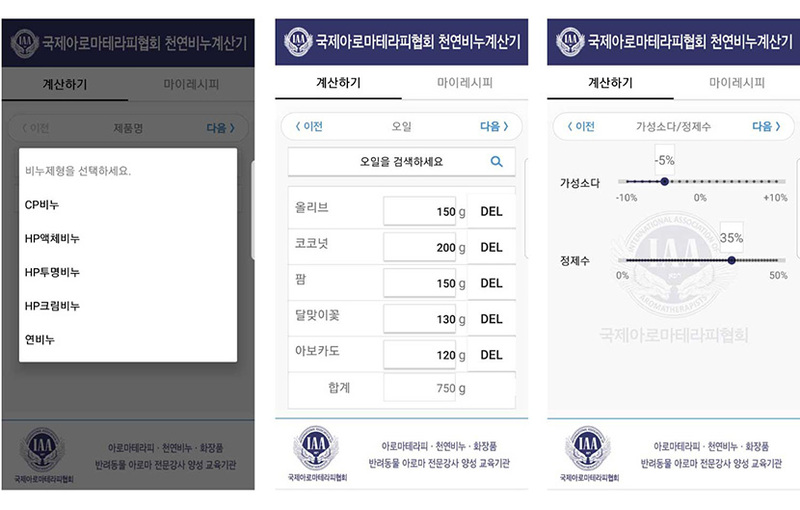 국제아로마테라피협회는 아로마테라피스트, 천연화장품강사, 천연비누강사, 반려동물아로마강사, 국제아로마테라피스트를 양성하는 전문 교육기관으로 앞으로도 더 많은 프로그램으로 전세계 아로마테라피스트의 권익을 위해 노력하겠습니다. 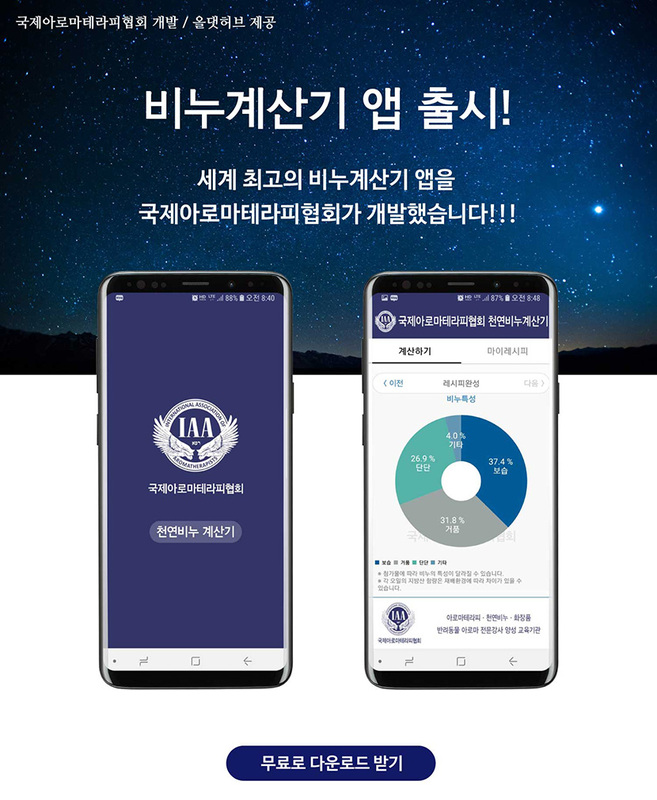 여러분들의 응원과 사랑으로 더욱 더 발전하는 모습 보여드리겠습니다.